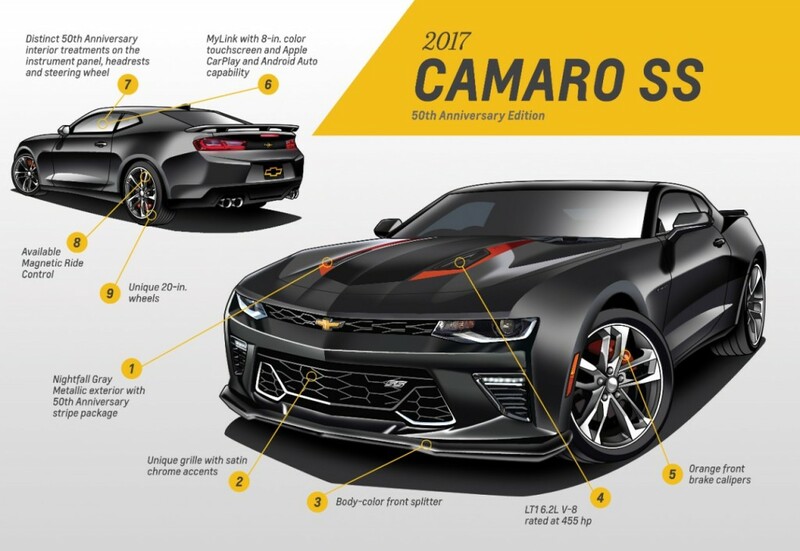 The Chevrolet Camaro is approaching a milestone, and the brand has some exciting things planned to not only celebrate with activities, but for those looking to own a piece of history. Chevrolet slyly revealed it would be bringing a very special edition, 50th Anniversary Chevrolet Camaro to production to celebrate. 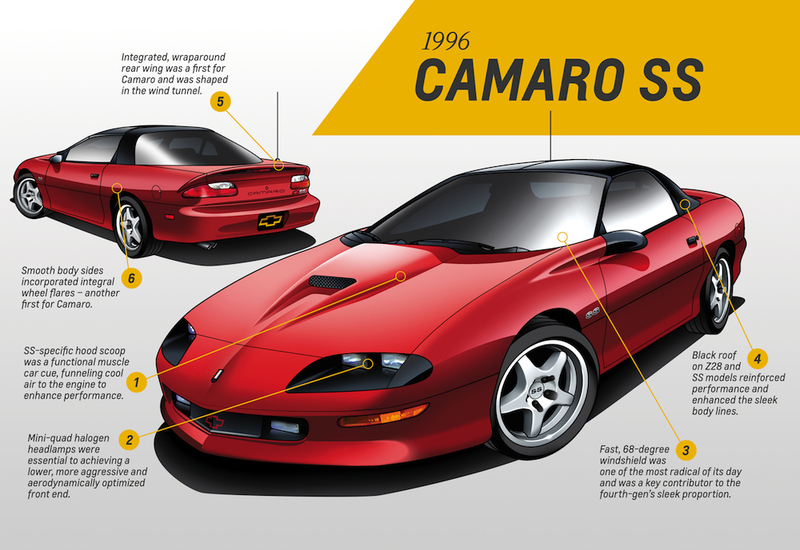 Before we get to that, let’s take a quick stroll back through the six generations of Camaro. 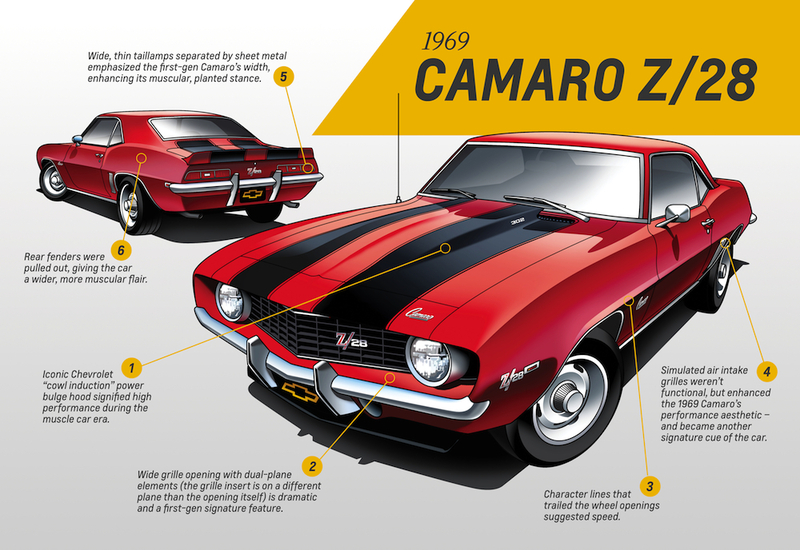 The one to begin it all, the first-generation Chevrolet Camaro was undeniably a response to the popularity of the Ford Mustang, but took on an identity all its own. Chevrolet introduced the Camaro on September 29, 1966 and watched the pony car flourish to 221,000 units sold in one year. The second generation of Camaro went down as the nameplate’s most successful, and longest. Even through rapid changes in the industry (thanks, oil crisis) the Camaro kept on with a wider footprint and lower center of gravity. 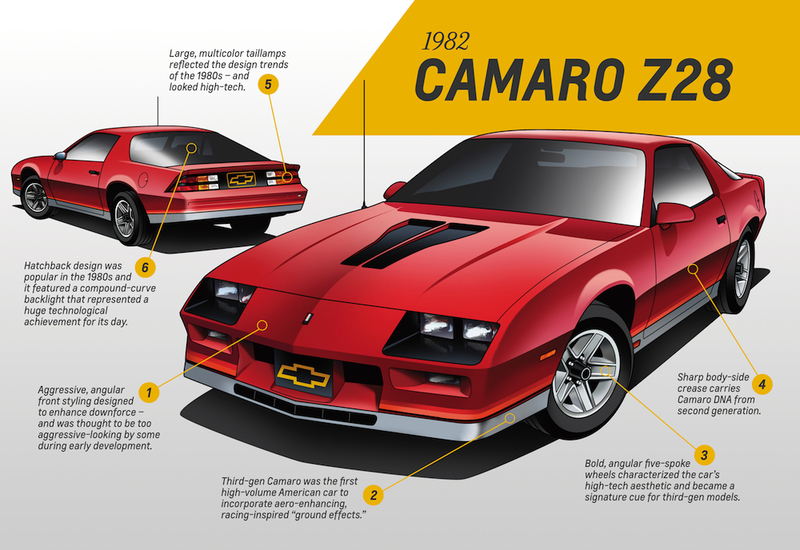 By 1979, the Camaro saw its best model year: 282,571 Camaros found homes; nearly 85,000 of those were Z28s. The third-generation Chevrolet Camaro introduced an all-new architecture, a contemporary strut-type front suspension, rack-and-pinion steering and more. The third-gen was also a secret track star, reaching its pinnacle with the 1LE package, introduced in 1988. Other firsts were present, too: the third-generation was the first Camaro to feature a hatchback and the first American vehicle to incorporate factory ground effects. It was named Motor Trend’s Car of the Year for 1982. It would be the end of an era. As the sport coupe market dwindled through the 1990s and early 2000s, the fourth-generation Chevrolet Camaro would be the last before a hiatus. Higher-power engines and chassis improvements built upon the F-body from the third-generation Chevrolet Camaro, but with sleeker proportions. The beloved LS1 V8 also found a home here, powering the Z28 and SS variants to new performance heights. Chevrolet shocked and awed media and the public alike with the 2006 Camaro concept. Four years after the demise of the nameplate, Chevy had something up its sleeve to bring the pony car back. With some help from Australia, the Camaro returned in 2009, seven years after the fourth-generation, riding on the Zeta platform with retro cues. The fifth-generation would go on to outpace rivals in the sales war, selling 500,000 copies. And here we are at present day. The Camaro has shifted from its Zeta bones to the nimble and lightweight Alpha platform, and receives power from the Corvette’s 6.2-liter LT1 V8 engine. Like its 1982 predecessor, it was named Motor Trend’s Car of the Year for 2016 and has only further cemented Camaro’s dominance as not only a pony car, but a world-beating sports car. So, to celebrate, the 2017 50th Anniversary Chevrolet Camaro will harken back to muscle car glory days. Nightfall Gray Metallic paint with orange accents reminisce Hugger Orange, and special “Fifty” badging is present throughout the entire car and bespoke 20-inch wheels polish off the celebratory Camaro’s duds. We say cheers to fifty years of Chevrolet Camaro. And many more. You are the one that needs to check your math, as there wasn’t a model year from 2003-2009, which is 7 years. 2016 – 1966 = 50. Pretty Simple! Chevrolet introduced the Camaro on September 29, 1966. 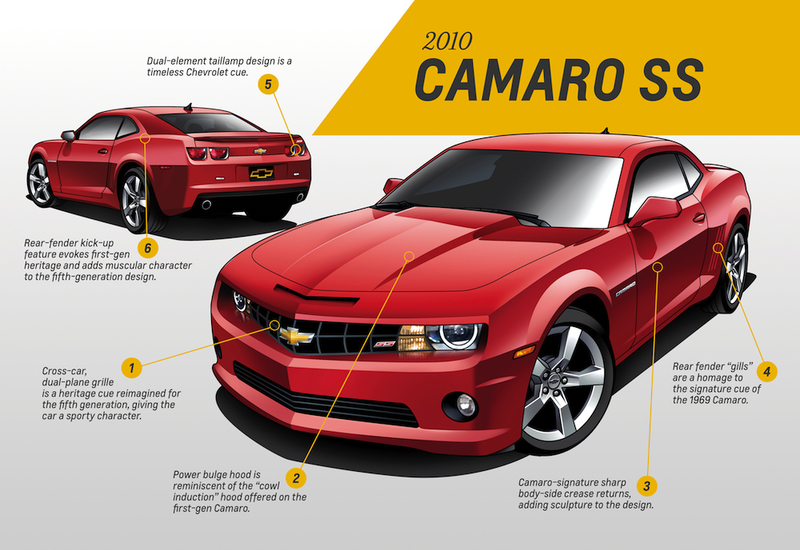 You forget to mention that the appearance of the 2006 Camaro Concept as the new yellow and black “Bumblebee” Transformer in the movies was the “spark ” (pun intended!) that increased sales of the new Camaro. As for the history, I drove a 1967 Rally Sport (with the vacuum powered headlight covers) so I am old enough to remember all of it. There is something special about every Camaro. From (if you can find one) 3rd gen 4 cylinder, To bare bones 1967 6 cylinder to Yenko Camaros to todays 2016 SS. Every single one including my least fave 4th gen lol, has a following. Next to GMs own Corvette, nothing compares. Nice Raymondjram! 67 RS must have been amazing. I have a 2016 and love to hear about the history and people who have shared Camaros. love the 2016 camaro but I dont like the high beltline and the thick A-pillars. Just bought a 5th Gen 2012 Camaro (3.6L V-6). It took me 45 years after returning from Vietnam to get my Camaro. The 1971 split bumper was my first introduction to the Camaro thanks to an ad I cut out of a magazine and kept with me in Vietnam. I didn’t have enough cash and no credit history to buy the Camaro so I bought a 1972 Vega GT. Then I got married, raised five kids, and served overseas in three more deployments with the Army Reserve. Through the years we owned a series of sedans and minivans and my dream of owning a Camaro was all but buried. When the 5th Gen came out in 2010 my interest peaked again. With the kids on their own now and a comfortable retirement, I began a search and found what I wanted. More importantly, my wife was finally open to the idea of a Camaro as our second car. I love the new style (don’t care for the large grill on the new generation) and the fact it still retains hints of the 1st Generation Camaro. It was worth the wait to get my dream car and our Chevy Traverse serves just fine as our primary transportation. Can’t wait to cruise around to the sounds of the Beach Boys this summer. Life doesn’t get any better than that.